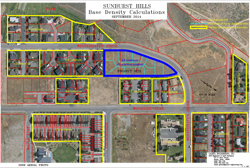 The Hailey City Council voted unanimously Monday to approve a preliminary plat for the proposed 12-unit Sunburst Hills “cottage townhouse” development in Woodside, despite criticism from nearby residents. The council voted to approve the subdivision of three home lots totaling 1.78 acres on Winterhaven Drive into 12 units, saying the plan met with all city requirements. Winterhaven Drive resident Sharon Browder organized a petition with signatures from all residents in adjoining Woodward Place and Silver Saddle subdivisions, saying developer Brent Tanner should be allowed to build only 10 units, while providing open space on the remaining .28 acres west of her home. Browder said her proposal would limit visual impacts from the proposed two-story buildings on the existing single-family residences in the neighborhood. Brian Yeager, Tanner’s engineer and representative, presented a map showing that Tanner’s proposed housing density was in keeping with the surrounding neighborhood. Yeager also said the height of his planned buildings was in keeping with city code. “Their [Browder’s] decision to build single-story homes on lots that clearly allow up to 35-foot structures was not our own,” Yeager said. City code requires that .33 acres of land be set aside in a 12-unit development for open space. The P&Z agreed with a July 1 Hailey Parks and Lands Board recommendation to allow Tanner to instead pay $41,000 in in-lieu fees to provide park space elsewhere in the city. Browder contested the in-lieu fee arrangement, saying that she and her neighbors were unaware of the “deal” that had been made between Tanner and the Parks and Lands Board, prior to a Planning and Zoning Commission meeting on the issue on July 14. “There was no practical way for the public to know about the matter to be discussed” at the Planning and Zoning meeting, Browder said. City Councilman Pat Cooley said he regretted that the Parks and Lands Board does not have more sufficient notification requirements, which could have allowed Browder and her neighbors to prepare a challenge to the in-lieu fee. “Open space is desirable but not manageable by the city,” due to a lack of funding for park maintenance, Cooley said. The in-lieu fee will be used to continue improvements at Keefer Park, about a mile north of Browder’s neighborhood. - The City Council made plans to approve a change to city law that would go into effect on Oct. 6 and prohibit electronic messaging signs from the city, and limit the height of fences at four-way intersections to 3 feet. The change would also provide a new definition for “animated signs” and provide a matrix for use in determining what types and sizes of signs are allowed in specific zoning districts. - The City Council voted to send a list of recommendations to the Bellevue City Council, pertaining to a proposed annexation of 227 acres into Bellevue, along with a letter stating the city of Hailey’s request to take part in the annexation review process.